A Virtual CISO (Virtual Chief Information Security Officer) is designed for organizations that need someone to take responsibility for the growth, implementation and maintenance of the information security program but cannot afford, or do not need a full-time CISO. 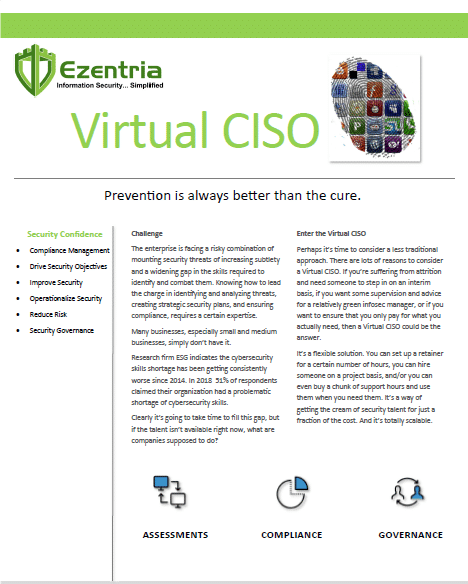 Hiring a CISO is expensive, Ezentria provides everything you need at a fraction of the cost. With this program all of our security services are immediately available to you on an as-needed basis. In addition to assuming responsibility for your information security initiatives, our team is always available to provide the security expertise and guidance you need. When you compare the results with the cost, it is easy to see why this is one of the best ways to assure expert security guidance and executive security leadership at your organization. The greatest benefit of engaging with an Ezentria Virtual CISO is the iterative and collaborative approach. This allows us to select only the most appropriate and effective controls based on your unique environment and mission. Decades of diverse and effective information security implementation experience help us to ensure that your information security needs are always met. Best of all, once you are part of our Virtual CISO program, not only do you have as-needed access to all of the services we offer, but you are also eligible to purchase these services at a discounted rate. Additionally, since this program features a customizable and flexible subscription model, you can rest assured that you are only paying for what you really need. The Virtual CISO service allow us to focus on your companies unique requirements. In fact, our existing clients report a savings of nearly 80% when compared to the cost of hiring a full-time CISO. Get the ball rolling and schedule some time to discuss your unique requirements. Contact us now to learn more about Virtual CISO.